“The best social scene for cigar enthusiasts in the city hands down. 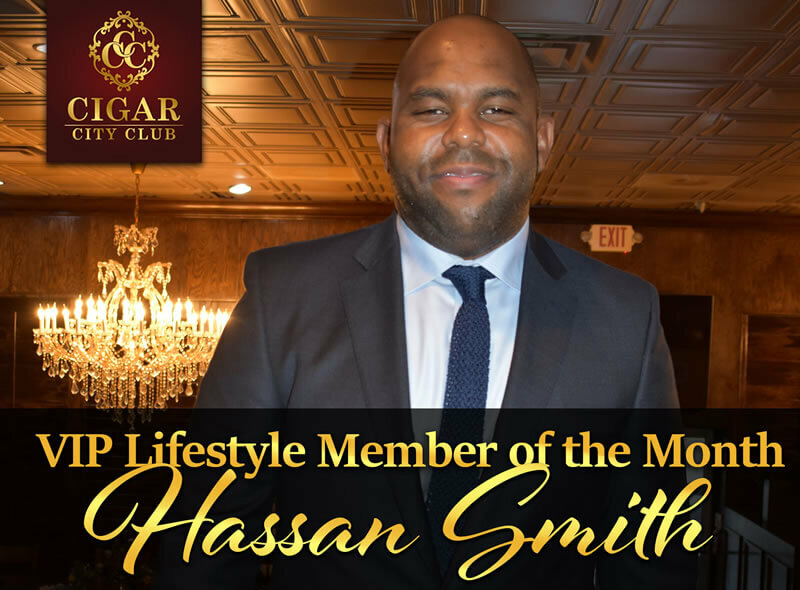 Hassan Smith first entered the doors of Cigar City Club thanks to the referral of his good friend and member, Sam Carter. Disappointed with the limited social options outside of a club scene, he typically just entertained at home and was therefore enthused to discover an alternative social venue in his very own neighborhood. Hassan often recommends CCC to others for the elements he enjoys most — its class, provided comfort and all around excellence that attracts like-minded professionals. Hassan is also impressed with his initial meeting and continued discussions with owner, Julius Bolton. This introduction was also a bonus for Hassan as he makes a concerted effort to support black entrepreneurship whenever possible while not compromising his standards for an exceptional experience. In a recent moment of reflection, Hassan realized that since his time with CCC, he has truly embodied the club’s tagline by turning his intrigue for smoking cigars — something he previously enjoyed only as a hobby, into a lifestyle. He also sees this evidenced in his newfound investments in fine cigars and with his CCC membership. Some may find it amusing that Hassan proudly enjoys the well regarded Liga Privada No. 9 cigar with an ice cold VOSS water (with lemon) as his personal choice to cleanse his palette, the reason…he is not a drinker, never had an alcoholic drink in his life! Hassan has built a successful empire covering the areas of entertainment (20 years in the business), real estate, investing, consulting and helping his wife build her business in family medicine. He credits his father for seeding him with an entrepreneurial spirit, to love what he does for a living and to never limit himself to a capped salary. Hassan ran with that advice; after receiving his degree in Business Management, he started in security with his then 6’4” 300-pound stature and intellect as a means to get a “foot in the door” of the entertainment industry. His early clients included hip hop artists JaRule and Ashanti while at the height of their music careers in the early 2000s. A few years later after selling his successful security business, he transitioned into management for then newcomer singer/songwriter John Legend whose career he continues to help thrive. Hassan is also Member of 100 Black Men of Atlanta and believes in the mission to connect with younger generations and expose them to alternative lifestyles, giving them a different perspective of what’s possible contrary to the negative stereotypes they may see in the media. Hats off to CCC member, Hassan Smith for setting a great example to our youth!